"We will never be able to thank you enough for kicking off our annual management conference with non-stop, side-splitting, tears-rolling, knee-slapping, jaw-hurting laughter." "He is guaranteed to bring laughter to your event while reminding you to take life serious but don't forget to laugh along the way." "...Let me unreservedly recommend the talents of J.B. Smith as an entertainer, a motivator, a man with significant insights into business and people..."
"You, once again, 'showed your colors' as an articulate, humorous, successful veteran and veterans advocate." "You brought back memories of hair wax and wheel covers, and we laughed at 'the way we were' as much as we laughed at what you told us." "Without a doubt, everyone in the organization has said that you were the best speaker we've had all year." "Your program was very different from past programs and refreshing." "At lunch downtown at noon today everyone was talking about you and how very much they had enjoyed hearing you, and how very good it was to laugh for a change." 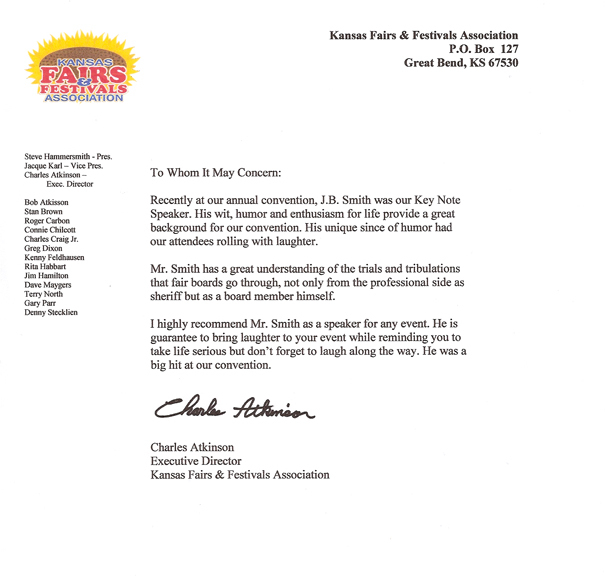 "It is an honor for me to recommend Sheriff J.B. Smith as a speaker for whatever the occasion you have in mind." "I honestly can't remember the last time we had a speaker that made such an impact on our attendees, and for that, I thank you!" "...Your presentation was not only humorous but makes some excellent points that are pertinent to every walk of life, and delivering it as 'Cowboy Philosophy' is as entertaining as it is educational." "...I heard many favorable comments from board members representing about sixty County Fairs from all parts of the State of Nebraska."" "His leadership in area communities underscores his humanity and generosity. Most importantly, his love of life and laughter cause him to be an ideal after dinner speaker." "It was a true experience in laughter to hear you speak." "...Your insight, knowledge, experience and delivery with humor was successful at informing us and giving us a new way to view our jobs and life." 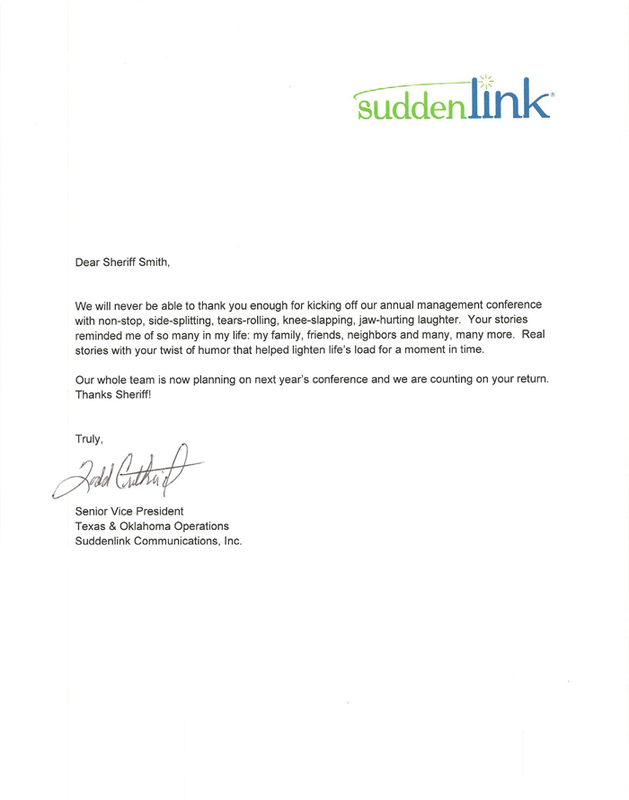 "...Many of our employees wanted to personally thank you for your interesting and entertaining presentation." "We haven't laughed so much at one of our meetings since—well, we've never laughed so much!" "...Thank you again for helping us provide a fun, educational and positive learning experience..."
"Your timing was perfect and the stories were very funny. You kept 'em laughing nonstop, yet delivered a worthy message."